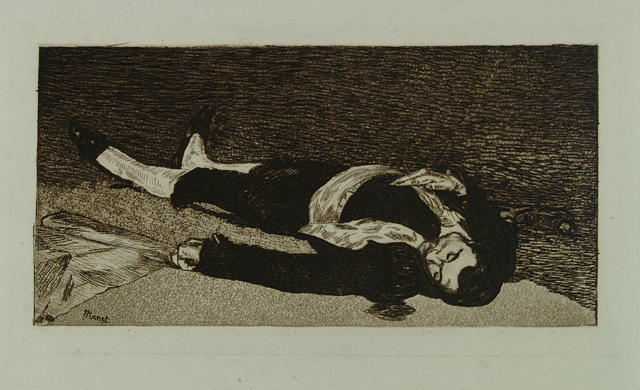 Édouard Manet (1832-1883), Dead Toreador, 1864, etching in sepia tone ink, 3 13/16 x 7 5/8 inches. Brigham Young University Museum of Art, purchase/gift of the Mahonri M. Young Estate, 1959. French artist Édouard Manet, born January 23, was one of the most influential forces in 19th-century realism and early modernism. Manet produced starkly naturalistic images, such as this etching of a Spanish matador killed in the bullfight arena. The print is based on a larger painting by Manet that originally showed the dead toreador, the bull, and other fighters in an arena of spectators. The blunt view of the gored matador—his abrupt death underscored by the diagonal, upside-down view of his body and face—received strong criticism when it debuted in 1864. Manet cut the painting into sections, from which he made two separate, stronger paintings, including the Dead Toreador now in the National Gallery of Art in Washington, D.C.